In order to uphold the architectural tradition of the surrounding area the developers of Koh Samui are usually selling a certain style of property that showcases the elements of traditional architecture. This is the reason why there are very few property types that you will encounter in Koh Samui that are offered for investors. You need to keep this in mind when searching for properties that are available to buy here because these are probably the layouts that will be offered to you. The main type of property that is usually requested by investors is one that has a sea view. This can be an amazing investment option as it can work both as a vacation house, a retirement home or a vacation rental because, let’s face it, who doesn’t want to have an amazing view from their window? So villas with a sea view are the most sought after properties. 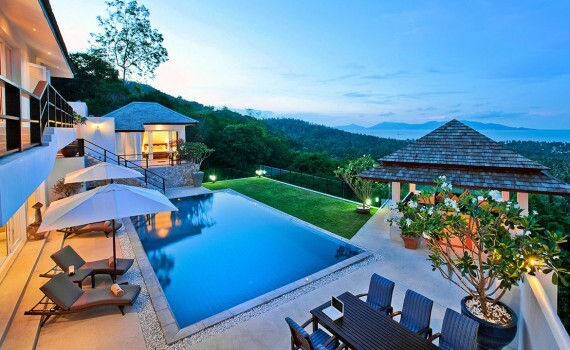 However, Koh Samui villas for sale come with a hefty price. If you only have a couple of millions to spend, you should reconsider your options and probably search for such a property when you are closer to 10 million Baht. Usually villas at this price come with a smaller pool and are just around 150 square meters. You can also opt for garden style villas which are usually accompanied by a small terrace outside and swimming pools. These allow those who come here to have a glimpse of the lavish Thailand vacation home but you won’t find those at this price. Those who want a bigger private pool should look for Balinese style villas as they offer more for a smaller price. They are usually around 10 million to 15 million Baht and you can build one or buy one for a lower price. The advantage of such a villa is the large area that surrounds it and the fact that the villa itself is usually larger, with 2 to 3 bedrooms and living room with open plan kitchen, Unfortunately, there are very few Balinese style properties in Koh Samui and those who have already been built are increasing their value. This can be a good investment opportunity for someone who has the money now as they can easily sell them later for a good profit. Make sure that it comes with a garden and a large enough pool as just being Balinese style is not enough to be desirable by potential customers. The most important aspect when purchasing property in Koh Samui is to not expect to find a lot of sea view properties because they are in short supply and those that are for sale have become very expensive.